Wishing you all a happy 2010! Ever since I bought my Cricut Expression last February, I have been wanting to buy a Christmas cart so I can make Christmas cards. But since I ended up buying a whole whack of Christmas cards at amazing prices in January, I told myself I would use those up first. 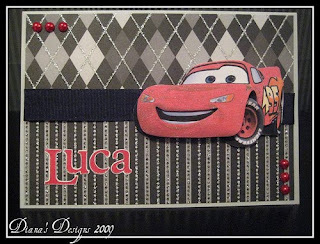 When a co-worker asked me to make a card for her son for Christmas, I couldn't resist. 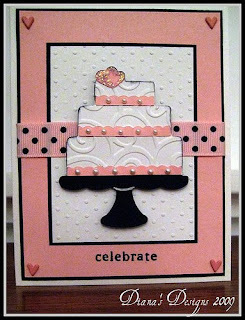 I turned to CPS this week for the sketch and used colours from Color Throwdown to come up with this card. 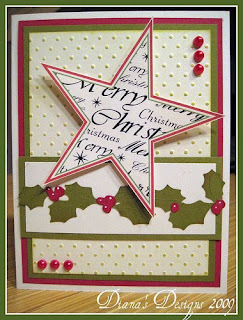 I used a 4" holly border from the Cricut Stretch Your Imagination cart, Swiss Dots embossing folder and a star I designed in Microsoft Word. I can't say I'm overly thrilled with the result but I can always change it, I suppose. I have finally forced myself to create a card for a challenge and, though I had to stay up really late, it was worth it. 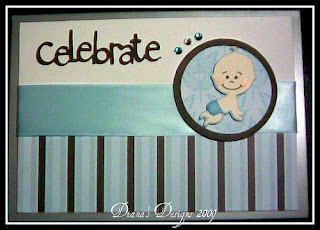 I was asked to make a baby boy card for a co-worker and so I turned to ICSketches for the layout of my card. 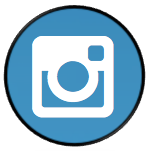 This is a 5 1/4" square card. The name is cut out twice at 1" using the shadow feature from the Pooh Font cartridge. The cute puppy is cut at 3", twice on two different blue papers, and once using the shadow feature from my new Sweethearts cartridge. 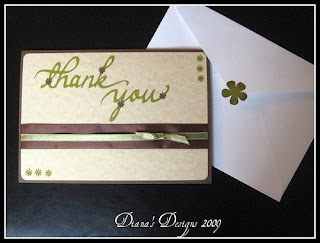 I used my Fiskars border punch and dollar store stamp for the sentiment. I also used a hole punch for the eyes, coloured them in and drew on the mouth. I really like how it turned out. It seems I'm using chocolate brown in my cards a lot lately. 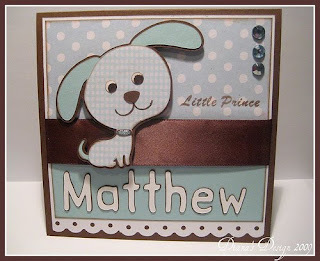 I just thought I would share with you this amazing digital stamp set that Regina is giving away. 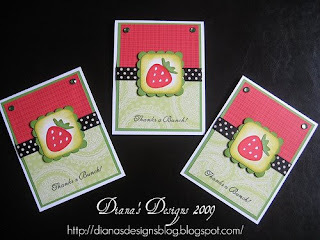 She is the owner of The Cutting Cafe and is generously offering an assortment of stamps from her Christmas Daily set. Details on how you can take advantage of this limited time offer can be found here. 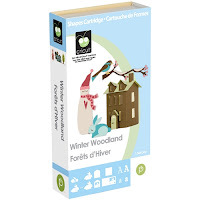 Help celebrate Cricut's 100th cartridge—Winter Woodland! That’s right, they reached 100 cartridges. 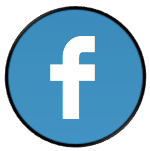 As a thank you, they want to give away 100 cartridges over the next five weeks (20 per week). 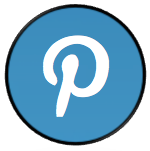 Each week they will be posting a thread. When you respond to the thread you will be entered to win. You can enter once by replying and you can enter a second time by posting on your blog about the celebration and linking back to the cartridge product page. 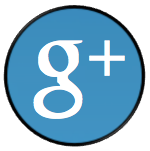 Here is the link to include in your blog. 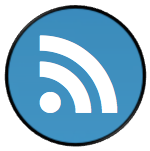 Once you’ve posted on your blog with the link back you can post again to this thread. 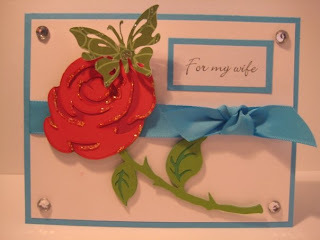 Here's a card I made using my new Cricut Weddings Solutions cart. 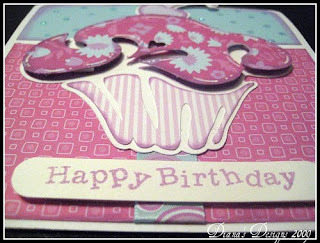 I embossed the cake using the Cuttlebug D'vine Swirls folder and I think it was cut at about 3" twice, once in white and then in black. I cut the cake stand off of the white layer and placed the cake on the black layer. 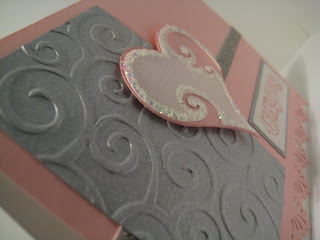 I added some faux pearls, heart brads and ribbon, and used my new Swiss Dots folder as well. 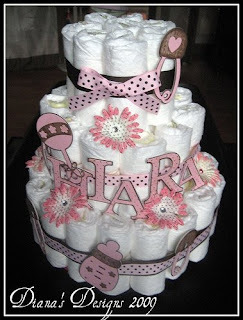 The cake was adhered using dollar store dimensionals and the stamp is also from the dollar store. I lightly inked the cake edges with black and added some Icicle stickles to the heart. I can't wait to make more of these! I recently returned to work and was pleasantly surprised to receive a greeting card with a gift card from my staff to celebrate the birth of my son. 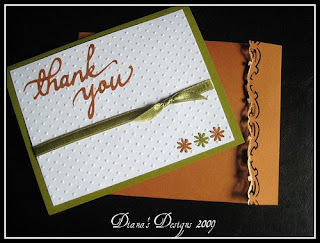 I made this card as a thank you and was so happy to make use of one of my latest purchases, the Cricut Beyond Birthdays cartridge. 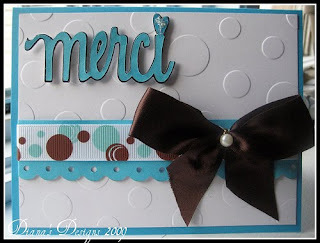 I love that it has "Merci" since I am the French teacher! I can't remember the size I used but I'm guessing it was 2". 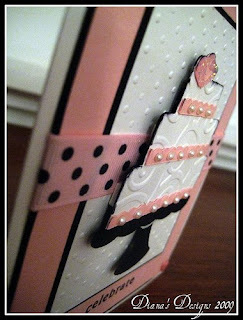 This was also my first card using the Quickcuts A2 embossing folder called Polka Dots that I ordered off of Ebay. Isn't it fun? 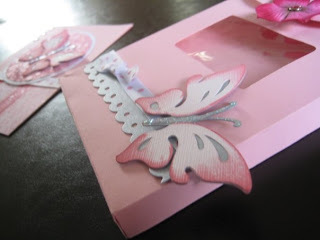 I used the Fiskars Threading Water border punch and recycled the bow from a treat bag. I love how this card is so simple and fun! 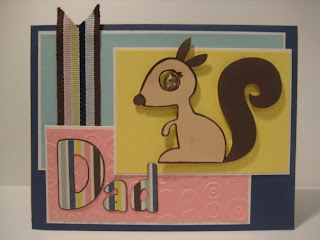 Here is a card I made for the son of a friend of ours using this week's sketch at ICS. 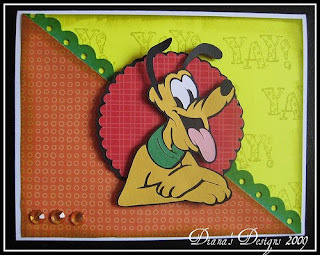 I cut Pluto from the Mickey and Friends cart at 3", and the scalloped circle is from the Home Decor cart using the blackout and shadow feature also cut at 3". 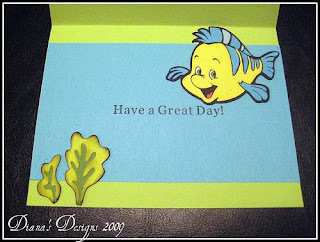 I used my Fiskars Threading Water border punch, design paper from the Cricut Celebrations pack and used a stamp for the background of the yellow paper. I also added some dimension to pop the image. I can't believe that half of the summer is over and that all the stores are stocking up on Back to School merchandise. To be honest, I'm actually looking forward to returning to work in September, even though I know I will miss my kids dearly. I will also miss having the free time to make cards and other Cricut crafts because that will soon be replaced with marking, planning and stressing over my job! I'm hoping it won't be so stressful but it will be interesting to see how I handle things now that I have two kids to look after during off-work hours. I'm afraid my Cricut will be much neglected as it has been this past month but I am excited to try out my new Home Decor cart that arrived a couple of days ago. I am also eagerly awaiting three new carts to be delivered: My Community and Locker Talk will come in handy for back to school, and Beyond Birthdays. I will add more details when I have the time. Right now, my eldest is beckoning me to have some bubble fun! 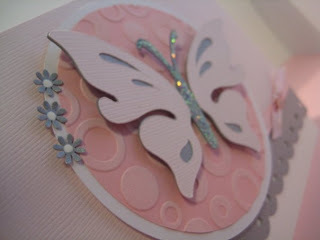 The paper for the front of the card was recycled from a Birks gift bag and the paper for the back of the card was from a DCWV glitter design pack. 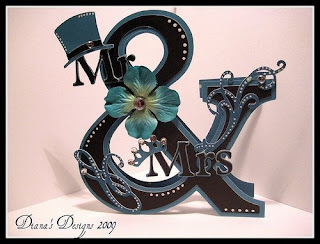 The ampersands were layered using the shadow feature and cut at 5 1/2" and the Mr and Mrs were layered with the shadow as well at 1", all from the Plantin Schoolbook cart. The swirls were both from the Home Decor cut at 1", I believe. And the top hat and tiara were cut using the Paper Doll Dressup cart at 2 1/4", I think. (Can you tell I'm not very good at making a point of what sizes I used?) 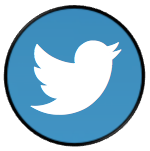 I probably could have used the Real Dial Size but I like to make things more difficult than they have to be. 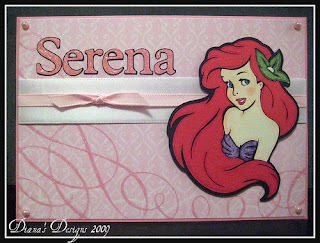 Oh, and to make the card without the DS, I just made a front and a back, and stuck the back on by folding a small part and sticking that on to the front. I'll add a picture to better illustrate it. It's my brother's first anniversary this weekend so I made this for him and his wife. I hope they like it! My son's baptism is soon approaching so I had to quickly send out some invitations. 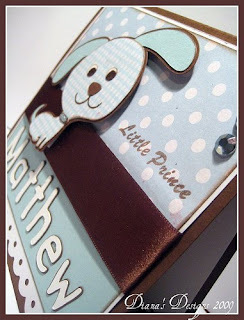 I turned to ICS for this week's sketch and used some SEI papers and a couple of Cricut cartridges to create my design. 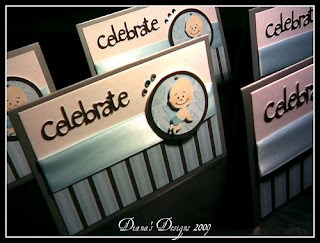 I used the Celebrations card for the sentiment cut at 3/4", and the New Arrival cart for the baby at 1 1/2" and the circles cut at 1 3/4" and 2". I wanted to use the cross from the Wedding cart but I haven't been able to get my hands on one and then after I sealed the envelopes, I noticed I had a cross on the Indie Art cart. Doh! I still have a few more to make so perhaps I'll incorporate the cross on those. I didn't have my camera so I used my cell phone. I don't like how the photos turned out even after I edited them so perhaps I'll take another better shot of the new ones after they're done. Thanks for looking! For this week's challenge at Colour Create, they have given the option of selecting three colours from five scrumptious fruity colours. So out of raspberry, strawberry, kiwi, tangerine and blackberry, I chose strawberry, kiwi and blackberry. 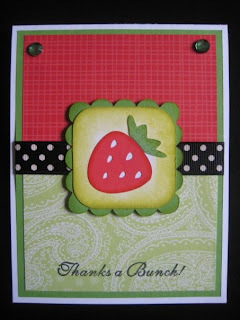 And I felt this was the perfect opportunity to use the strawberry cut from the Indie Art cart that I have been itching to try out. I also cut the scalloped and rounded squares using the New Arrival cart. 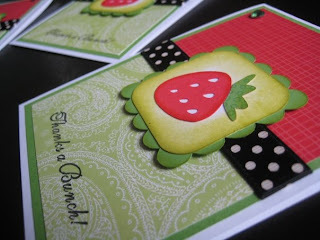 The red design paper is from the Cricut Celebrations pack and the green design paper is from the DCWV Glitter Sweet pack. 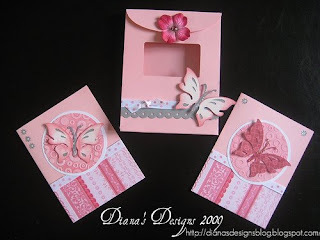 I remember watching this video a while ago by the Pink Stamper and what I remembered of the video served to be the inspiration for the layout. I made three of these cards to give to my daughter's teachers next week. She's graduating from preschool and her teachers have been so "berry sweet" with her for the past year and a half. I will miss having her in their class. 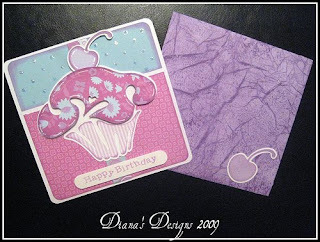 I made this card using this week's sketch at ICS and one of Dustin Pike's freebies for the image, which I coloured in using my PrismaColor Scholar pencils. 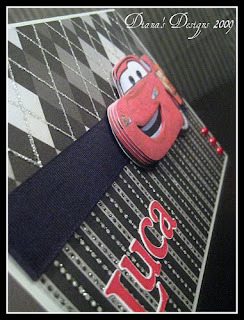 The designer paper is from the DCWV Glitter Sweet pack and I cut the daisies from the Mickey and Friends cart. I already have someone in mind for this card. 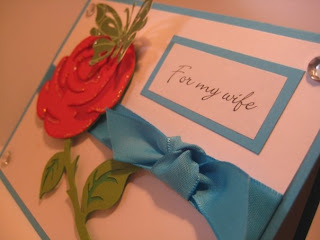 It's simple but sweet, I think. 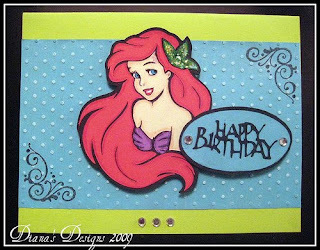 Here's a birthday card I made for one of my daughter's preschool classmates using this week's sketch at CPS. 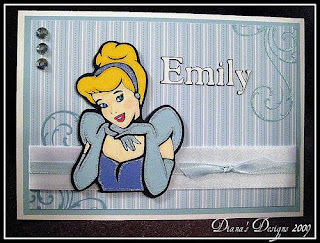 She really likes Cinderella so I thought this was the perfect opportunity to use my Disney Happily Ever After cart. 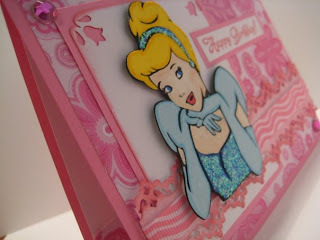 The designer paper is DCWV Glitter Sweet pack and I had to add some bling and stickles, with my daughter's help of course. She insisted we use pink! I hope her friend will like it as much as I do. 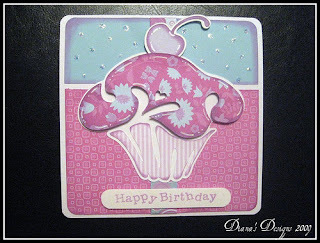 Here is a mini card set I gave to my sister-in-law for her birthday. 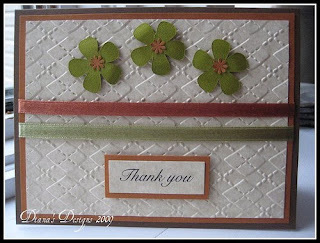 I used the butterfly from the Indie Art cartridge, and the crayon box from Tags, Bags, Boxes and More cut on a 12 x 12 mat using the Fit to Page feature. 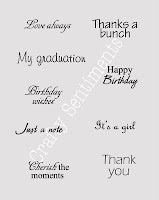 I received a lot of compliments on this set on the Cricut message boards so I thought I would share them here as well. I liked the sketch from Sketch and Stash Challenge #11 so much that I used it again here. 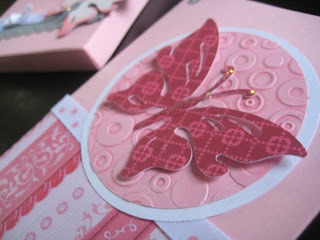 The paper is from the DCWV pack called So Sweet. And sweet it is! 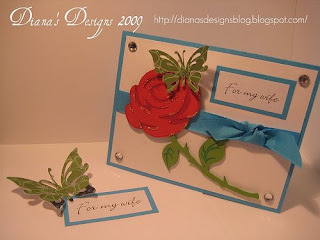 I made this wedding card using the sketch at Sketch and Stash, and of course, I had to use the gorgeous butterfly on the Indie Art cart. I cut it at 2" and the circles were cut using the blackout feature of one of the images on the same cart at 3" and 3 1/4". 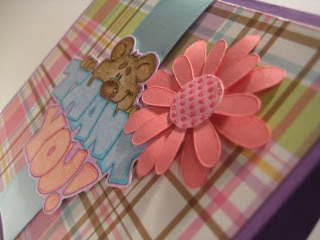 I used my Fiskars Threading Water punch and a mini daisy punch, along with some heart brads and stickles. The pink circle was embossed and I dabbed it with white ink. It looks much prettier than the picture shows, I think. 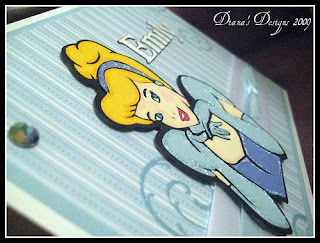 It's hard to see the texture of the Bassil cardstock. I forgot to mention that the heart brads I used were from my never used stash by Making Memories, called "Sabrina." They are the cutest little brads and I purchased them along with some (also never used) matching epoxy stickers. Don't laugh but... I don't have much ribbon that you would call "masculine" so... I used a Gap gift bag handle. And no, I didn't stop there. I also lack chocolate coloured cardstock so I used the paper from the gift bag as well. It was double-sided so I decided to make use of the patterened paper, too. 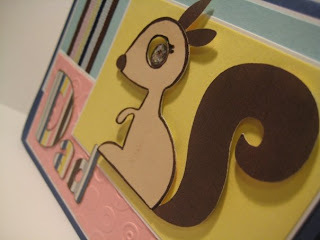 I thought the squirrel from the Happily Ever After cart was so adorable that I had to incorporate it somehow. And it's funny that the pink, yellow and blue of the Gap-themed colours kind of coincide with the colours on Dawn's sketch at ICS this week. 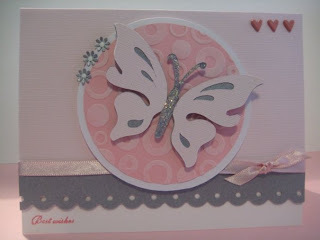 Anyway, this was a fun card I put together with the help of my three-year-old daughter, who was adament on using pink in the layout and putting on the stickles. She is so into pink these days! Here's a card I made for my cousin's wedding. I used the sketch from CPS and I like it so much, I might just try another card using that same sketch, it's so cute. 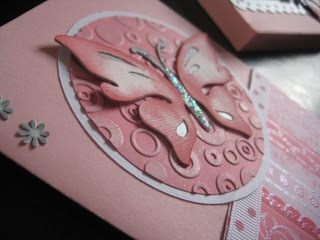 I used the daisy border punch by Fiskars, the D'vine Swirls embossing folder by Cuttlebug, and a strip of glitter paper from the DCWV glitter pack. 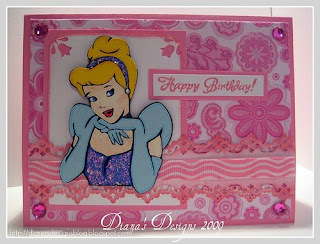 The heart is cut at 2" I think, from the Disney Happily Ever After cart. 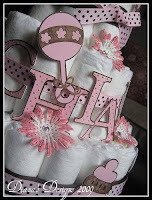 I also added some faux pearls and stickles to spice it up. I wasn't terribly keen on it when I was putting it together but it's starting to grow on me now.